Tangled and True: nursery lust. I want this nursery in my house. Words cannot describe how in love with it I am. just the solution for our childrens' book obsession. really. we have so many and I love all of them. wow! i just love the book display wall. definitely must remember that when i have kids!! 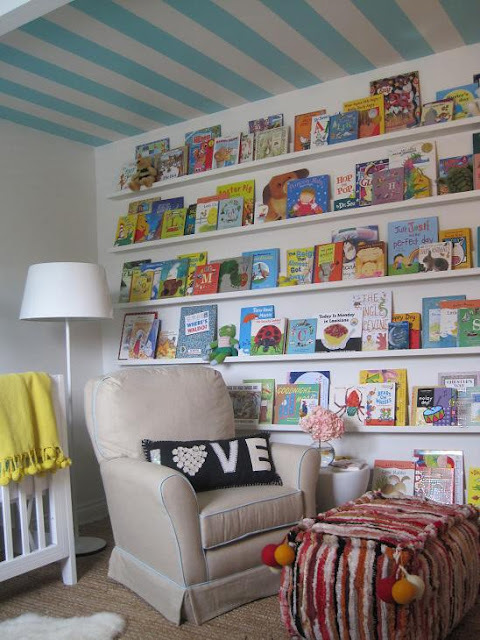 I don't want the nursery, but the book shelf for sure. The book wall is totally do-able. It can be done using rain gutters for the book ledge. They're super cheap and easy enough to hang. And my guess, is that it would make putting books away nice and easy, not to mention fun to display your faves. I've thought about using gutters in my classroom, too.